No, not a kitten, she's here to stay. Sorry! Welcome to my first venture into Sew, Mama, Sew's annual Giveaway Day! I'm showing you two here, so you can see it from different sides, but you're only getting one. I used Mary Englebreit's "Recipe for Friendship" cherry fabrics along with a sweet little dotted fabric for the backing and the binding. You can put this caddy on a mug, as you can see, or a heavy goblet, which is how I use mine. It has 6 different sized pockets on the outside. 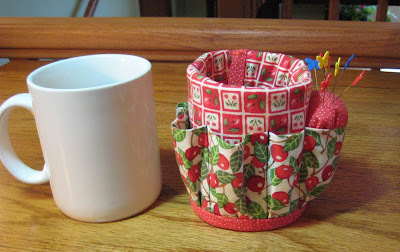 A small hair elastic loops over 2 buttons to keep it securely in place on your mug or goblet. You'll need to provide your own mug or goblet, but everyone has one of those laying around, right? There are 8 loops inside to hold markers, forceps, turners, etc and space in the middle, too, for small things like Fray-Check. It really holds a lot! I didn't overfill it so you could actually see into it, but mine is way loaded and comes in so handy next to the sewing machine. Some fiberfill and fabric stuffed into the largest pocket makes a really handy pincushion. This is what it looks like without a mug or goblet. I'll ship to the winner no matter where she or he lives and I'll do the drawing Dec 6th, Sunday. Depending on the number of entries, I'll either use my little white random number generator (see previous giveaway posts!) or just a regular one. Please make sure you have an email address affiliated with your comment so I can let you know if you've won so you can give me your mailing address. Nosey Parker says GOOD LUCK! And thanks to Sew, Mama, Sew for making this all possible. Be sure to go there and check out all the fabulous giveaways, starting Wednesday morning! Oh goodie I get to tell you about my strangest pet! A Rhesus monkey named Jocko! He was the cutest thing. He lived in a cage on the back porch but spent most of the time outside just climbing trees and sneaking into my dads work shed...where he 'rearranged' everything. We went somewhere for the day one time and came home and he had figured out how to open the latch on his cage. OMG the mess he made in the house. He took things out of the cupboards, he tore up magazines but the worst was the bathroom. My mom was speechless. He took everything from the linen closet and stuffed it all in the toilet. He emptied the medicine cabinet and put everything in the sink, with the water running. But the worst was he wrote all over the walls, the shower, the window, the mirror with red lipstick. I thought my mom was going to kill him. He was a fun pet, in spite of being a brat sometimes !! My funniest animal was an black and white gaunt named HEINI. He walked with me like a dog, if he want. And he loves yellow flowers (Fosythie, named in germany). Mice (and her children ;-) ) and birds. Strangest pet would have to be my father-in-laws cat who we have since inherited after he passed away 5 years ago. Just so you know I am a cat lover but this cat has got to be the grumpiest cat in the world ( or perhaps in NZ) He is always fighting the neighbors cat and has very raggety ears now. We have to shut him in the laundry at night otherwise he attacks us if we don't let him under the covers. He's about 16 years now but when he lived with my father-in-law he would catch up to 10 birds a day. My father-in-law used to breed budgies and one day a budgie got out of the avairy, t was caught by Flicker the cat and bought safely back to my father-in -law. When he was a kitten he would go over to the neighbors and steal her baby knitting (kneedles and all) and bring it back home leaving a trail of wool. Yay for giveaways!! Um......my strangest pet would be our rats but my Mum and her brother used to have a pet crow!! Uncle Sandy rescued him (he had a broken wing) and he used to sit on their bin lid and eat chips. Heh. He was known for nursing sick animals, my uncle!! That is an awesome caddy!! That is a first that I have seen anyways. I really like the caddy - I use a plain mug to put beside my machine. This is much more useful. My father used to have a pet monkey so I guess that is the most unusual pet. Does a CoolWhip lovin' cat count as strange? Other than my kitty with an unusual choice of treats, I guess my strangest pet was my turtle 'Cracker' who we found on my great-uncle's land when I was probably 3 years old. Wow! All these giveaways...I can't believe I missed participating in the SMS giveaway day AGAIN! Strange pets...hmmm I had a white mouse growing up. I had 2 turtles in college...they were from an ecology project (no harm was done) so my lab partners and I split them. They were so stinky and gross! We have a hedge hog. Her name is Pixie. She is my daughter's, and has weekly visits to my sewing room while her cage is being cleaned. These are so cute! Would love to win one. We had a bearded dragon. Gosh, the kids wanted it so bad. So dh decided why not. Guess who got to take care of it. He always wanted to come out of the tank. I was too creeped out to pick him up. Well the strangest pet I had was a congo african grey parrot named Rosie. Not very strange but new to me. She was wonderful! Talked a lot and used to freak out my husband :) it was fun. What a neat idea: coffe mug caddies. I love the goblet caddy!!! So adorable. As far as strangest pets...I would say all three of mine are strange. I have a Corgi, Pound Puppy and a kitty and they all follow to my sewing studio every day. My cat tries to get in front of the computer or the sewing machine, if she isn't getting enough attention. Believe me there is never a dull moment in my sewing space. What a neato caddy. I would put it to good use. Besides my current (and strange) yappy dachshund, we get lizards in the house. I name them and tell them to get out, but they never listen to me. Eventually they croak and I find dried out bodies behind stuff. Really gross. They should listen to me. That is a wonderful little caddy! 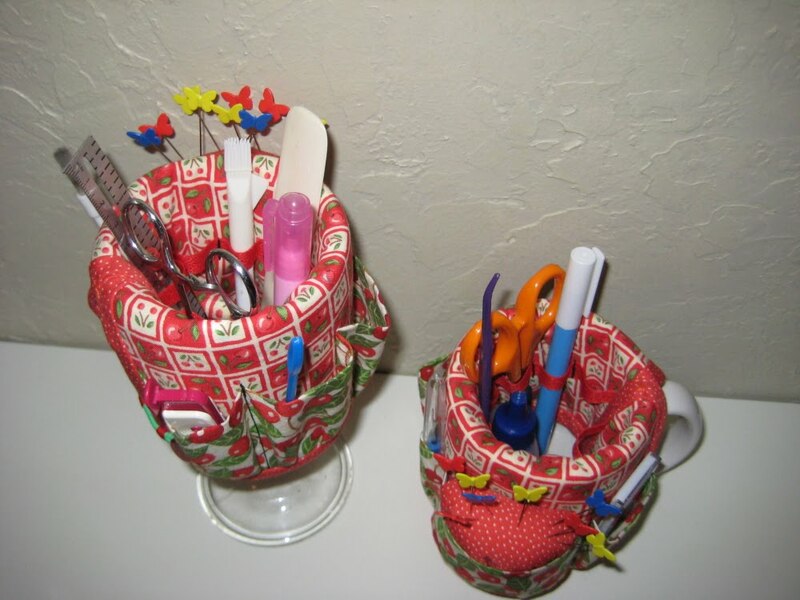 Perfect for sewing, scrapbooking, and crafts in general! Wow! My strangest pet was a mut named Chewbacca. He was stupid and clumsy and way bigger than anyone ever dreamed he would be! He also had an abnormality that made his legs twist and bend until his front paws were literally backwards. His knees on those front legs rubbed together and his tongue was literally too big for his mouth. He was the sweetest, most loving dog I've ever owned but he looked like a freak show! Hi! Love your caddy, I'm working on your sewing organizer from your tutorial now. I've had almost every kind of pet, turkeys, ducks, chickens, cattle, snapping turtle, a racoon for a day or two..
We have two bunnies and they are a handful. Oh my goodness, I want that caddy!!!! I have cherries in my studio and lots of cherry red. I love your design. Not much as far as a strange pet, just a nocturnal cat that liked to chew metal window blinds and a $200 watch. I have had many doxies over the years, each with different personality quirks. I used to have a little wirehair Dachshund name Quija. She would run up and down the fence over and over. Then come in and sit, plop, in the water bowl to cool off. Then repeat. Love the little caddy. It would come in very handy. We have two rats! and one is hairless and her name is Hariette. Wierdest looking think I ever saw! Strange Pet? As a young girl, I had a pet skunk, named Flower (of course!). When I was about 6 my auntie took me to the Barnum & Bailey circus. She asked me what I wanted and I pointed to a little green turtle. So she bought "Speedy Gonzales" (yes that's what I named him) for me and I had my little friend for about 6 months - then one day he disappeared!! We looked all over the house but we couldn't find him. Well, we did find him many years (yes years) later when we moved the couch. It was a sad day indeed when I had to bury him (along with all the other pets that went before him). I also had 2 pet rabbits as a kid but you really don't want to hear that story. The bottom line: I "thought" they were MY pets and my mean step-father thought of them as food. BOO-HOO. I had crayfish as pets in the 4th grade, I loved those little guys. I still weired out when people talk about eating them. Well, we've had hermit crabs, lizards, birds, hamsters, dogs, etc. 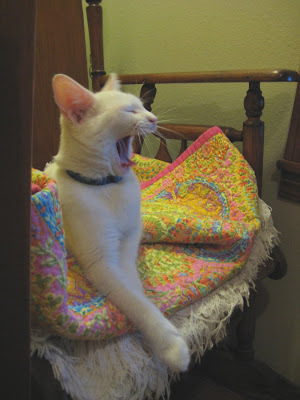 but our "strangest" was our cat Seis, he had 6 toes on each paw and had a favorite chair that if anyone came to visit and sat in that chair he would lay in wait and then jump on the back of the chair and swat them in the head until they moved! Love the caddy - you have such clever ideas! That is super cute! And as for strange pet, we had a teddy bear hamster growing up - so he had long hair. My brother called him Dirt Clod. Otherwise, we had normal pets, but we named them after holidays - Easter, Christmas, St. Patrick... My hubby had a 6 ft snake he named Skippy (oh, the irony! )...thankfully Skippy passed about 2 weeks before I would have met him! What a great idea! I could put it to good use in my sewing room! We once had a pair of newts named Monte and Eddy. My husband still teases me about that. "She turned me into a newt!" My strangest pet was Murphy the dog. Anytime my husband told her to get in her 'house' she would jump in my lap and put her head under my arm so he couldn't see her. What a great idea! 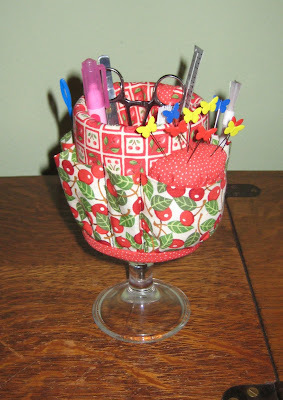 I have been wanting to make a pincushion caddy but this is even more practical! Great sewing accessory. Also would be good desk accessory. I am trying to think how it would be for bedside table in hospital or assisted living! Never seen a caddy like this - small and efficient - wow! I don't believe I've ever had a strange pet...well, unless you count my current dog with autism. She's kinda strange, but she's cute as a button, too! This is a great idea and I love the cherries! Oh good Lord is that a fabulous and handy little thing to have! I had to go and fave your shop at Etsy so I can find it again! Love the cherry fabric too! I'm sorry to say we are really boring, we've only ever had cats. BUT one is named Beaver and that always gets comments. Does that count as unusual? He's named after an Zuni Indian Animal Totem, we adopted him in Santa Fe and that's the name he had. So we kept it. we never had anything other than cats/dogs/chickens/parakeets...that's about it.oh a fish or two. When I taught school I had a classroom rabbit that was litter box trained- he just hopped around the room all day and nibbled the kids shoes. I also had a swimming turtle that ate live goldfish, which was actually sort of a disaster because the kids would get attached to the fish and be sad when they became lunch. Ummm... does my husband count as a strange pet? He is housebroken! JK! We are just a plain old family, although starting when I was a child, we have a habit of naming our animals after food. Must mean something, right? wow, brilliant idea and would help me alot. well, i didn't have any strange creatures, just 1 week old kitten ( became gorgeous cat), hurted pigeon (till he recovered). those are great coffee cup caddies! 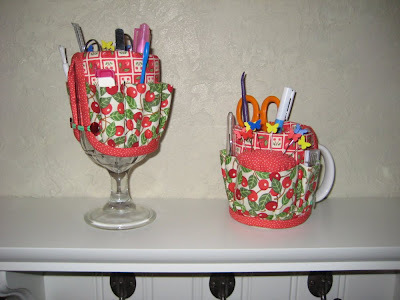 awesome for the sewing machine or desk! My family did not have very many pets besides fish, since my dad is allergic to practically anything with hair, so I haven't had really any wierd pets to speak of. I did have a turtle named Slow and at a different time had a cockatiel named Lewis. Whenever I would walk into my room, he would whistle at me. Anyway, the mug caddy is an ingenius idea, and very cute! The most bizzare pet was my pet Chick. I had her till she got too big, and then she had to go and live at my uncles farm. I was devestated to say the least (I was 8 then). I am sure she was someone's dinner :-( Sigh..
Those caddies are great! I've never seen anything like them and they seem so very useful. I haven't really had any strange pets, just cats and hamsters. My parent's cat is a little odd though. She's about the size of a kitten despite being 10 years old. She herds my parent's two huskies around the yard and they actually listen to her! No strange pets here. We did have a goldfish from the fair that lived in a plain glass bowl for 2 years (no air bubbler). I have no strange pet’s only strange behavior out of the pets I have had. I had an Australian Sheppard Panda and he was cross eyed and a little off his rocker. The coffee mug caddie is amazing and if I don't win one I want to buy one! When I was in high school, my biology teacher gave me the class tarantula at the end of the school year. I don't know why I accepted it. It scared me to death! I love your coffee caddy. What a clever idea. not much for strange pets at my house - just the normal cat, dog, and once a pair of gerbils. but outside my window i have several flocks of wild turkeys, a nesting pair of pileated woodpeckers, an occasional opossum and raccoon, and upon occasion we have a black bear wander through the yard. love the caddies and hope I will find a tutorial on your blog or elsewhere on how to make one - particularly if I don't win one of yours. Oh how cute! That would be perfect for the mug I use to put my painting supplies in. Lovely! We've never had a strange pet... just a strange named pet... "Joe Chicken Smock" and he was our hamster when I was little. Marlee's my boxer... she's a lil bit not all there in the head but she gives the best kisses ever. She's strange. She will come and lick you (kiss you) every single time she sees you and if I don't wake up from the alarm, she jumps up on the bed and paws at my head until I do! This is a great giveaway. I've never seen a mug caddy, very cool. As for strange pets... I don't think we've ever had a normal one. Currently we have a tarantula and a parakeet, but we also have had a couple of leopard geckos and a scorpion. When I lived with my Aunt in college we had a HUGE Iguana! For some reason our house seemed to be where all the injured wildlife in the neighborhood ended up. My favorite was the squirrel that would snuggle up under your shirt against your belly. His name was squeaky and the cat was confounded by him! Thanks for the giveaway! We were pretty boring - the strangest pets I had growing up were mice. One black, one white. Named them Salt and Pepper. See, boring. We had a descented pet skunk! I remember we drove forever to some farm in Connecticut USA to get him. He was a lot of fun, ate cat food and used a litter box. What a great idea, your so creative!!! The strangest pet I have ever had was a tarantula. We came across it in the middle of the road, and my mom had to pick it up. My dad hated it!!! We took it home and put it in an old fish tank, my dad put a brick on top of the lid because he wanted to make sure it didn't crawl out in the middle of the night. It only lived about a week, so either they don't take to captivity well, or my dad "helped" it out a little. How smart!! That is a great idea!! The strangest pet??? A goat?? We used to practice goat tail tying for our rodeos. Wow! That is so clever!!! What a fantastic idea. Hmmm...a strange pet. Ummmm...sharks? Yeah, we had little freshwater bala sharks growing up. That's about as strange as it gets. The strangest pet I had as a pig - I was 3 years old - and we lived in the islands...the pig's name was Porky (of course) and he was cute and pink!!! Where did you ever learn to make that adorable caddy!!! Never really had a *strange* pet. But the SMELLIEST pet we ever had was that blasted hamster of my brother's. ewww. What a great giveaway! Very clever! I guess the most interesting pet I had was a baby snapping turtle. I found it while out hiking with friends when I was in middle school. I didn't get to keep it very long because it bit several of my friends! It never bit me, and I still think about that cute little thing! Thank you for the giveaway. Oh, these are really cute and clever! When I was younger, we had angel fish, which we bred, I saw them grow from tiny eggs to tadpole-like thingies, to full grown angel fish - really neat! I love your giveaway. I've only had normal pets, rabbits, hampsters, ginnea pigs, dogs, cat, duck, fish,& turtles. Right now we have a crazy dog he is not normal at all but we love him. Thanks for the giveaway. Thanks Flossie! We had a snake growing up that disappeared in the house and was never found. And then the cat that recently went through an plumbing access door and got stuck/lost in the the floor structure so we had to cut a hole in the kitchen ceiling to get him out. We've only had dogs, cats, and fish. When I was young, my brother tried to keep a small lizard-type thing he found in the yard as a pet. We had it in the house in a fish bowl for a day then it just disappeared. What a cute caddy! I had a pet rat named Frisky that would fall asleep under your shirt collar with her nose sticking out. These caddies are a fabulous idea and this is the first time I've seen something like them! I'd be honored to stow my "stuff" in one. My strangest pet would have to be a hedgehog because that's the only pet I've ever had that wansn't a cat or a fish. He definitely wins the prize for cutest nose. What a clever idea! Very handy. The strangest pet I've ever had was a Vietnamese Potbellied Pig. His name was Newton. (As in "Pig Newton".) He liked to eat Oreos and kiwifruit. What a wonderful caddy! Gotta have one! Please pick me!! My sister's class hatched chicks in an incubator and she brought two chicks home whe school was out. Said chicks somehow bonded with me and followed me everywhere. They did grow up to be a lovely hen & rooster which meant I had to keep finding her favorite laying places. We had wild box turtles in our backyard for two years that we treated like pets. We occasionally fed them when we saw them. They stayed in our yard for a full two year though, never left. Om my goodness--here's an awful story. My mom was a science teacher and had tanks with reptiles. One spring break she brought home a tank with two tree frogs. My sister and I went to feed them and they jumped out. We couldn't find them. Days later we found them stuck to the wall above the floor heater all dried out!!! Yikes-they must have gotten stuck and the heater got 'em! We've always felt bad about it--poor little frogs. The sewing caddy would be so useful! The strangest pet I've ever had are the two turtles we have right now. I've had them for about 6 years. My mom had a pet skunk and pet groundhogs when she was a kid though. WOW Susan! What a really clever idea!!! I just LOVE it so please include me and give me a good number.... (cork with some honey on it????) just kidding...:-) Fantastic item though. Can I have the pattern if I don't win?? Sorry, forgot the pet question... no strange pets here... only dogs and goldfish and once a guinea pig who started biting anyone coming near... that's about it so no funny story.. was too excited about the caddy! These are really cute! Thanks for the opportunity to enter! oohhh what a wonderful giveaway! what i wouldn't give to have that caddie (or to learn how to make one). amazing, i tell you!!! my parents never allowed me any pets unfortunately. so as soon as I moved out i got a girl dog. eheheh she's my princess! then i joined a pet organization and the revenge was complete. we have had two dogs spend the night while they weren't adopted or their owner found, we have rescued a kitten and 2 more cats that are now living happily with new families. also, we rescued a dog and he is so big that noone wanted him but we fell in love so he's been with us ever since. we had the world's biggest dog for awhile and a ferret. the ferret stunk soooo bad!! i couldn't stand the dang thing. your cozies are soo cool. what an interesting idea!! Weirdest pet was a duck. It followed us everywhere. Strangest best was a small lamb, who just wanted to be part of the family! That is so cute!! I've never had any exotic peta, but my beagle/dachshund mix is very very strange! lol! that's adorable! No strange pets for me, I am not really an animal person! Lovely item! Great colors. The strangest pet I've ever had was not strange for what she was but more for her personality. She is simply a cat named Orange but her mannerisms don't match that of a cat at all. We often compare her to geese, goats, or fog horns. She's very loud. I love these. I have a few mugs around the house and I have been wondering what to do with them. The strangest pet...I think would be my duck. I got him and raised him on oatmeal. He would sit on the sofa with me under my "wing" arm. A towel under him of course. He would follow me around outside and if I got too far ahead of him he would quack until he caught up. I am actually getting teary eyed. He was a great pet. that supper cute! I want to give my friend because she made few blanket for my kids and I want get something for her...so cute! I don't believe I've ever had a strange pet. but I have lot pet are cats and dog long time ago..
but one I have dog when my boyfriend and I get argue or just scream and my dog get jump on me and scared. but i think it so cute. What a clever lady you are, I love the caddie and would love to put it to use in my sewing room. I must have that! I know right where I'd put it. Right next to my sewing machine. How cute! When I was a kid I was given a bug catcher/keeper. I went outside & caught all sorts of creepy crawlers (couldn't pay me to do it now..). I was happy until the black widow spider killed everything in there...UGH.. Thank you for the chance at the great caddy. this is so cute!!!! count me in. we never had pets...the most exotic was a pet turtle when i was about 7 or 8 and everything was going well until i left it in our wading pool on a hot summer day for too long. can you say turtle soup? oops! I was hoping for the kitty ! The mug holders are great to recycle those free but ugly mugs...Our "oddest" pet is the pony that lives at Lemos Farm. Our daughter thinks he's hers but shares him with other kids! The oddest pet was a goldfish my brother found in the storm ditch after a heavy rain- no matter what we put that fish in, it grew too big! We think it was a koi, washed out of someone's pond. He was 6 inches long by the time he died! Hmmm, I haven't had that many off the wall pets. When I was in middle school, though, my goal was to be a junior poultrywoman, so I raised a whole mess of chicks on my porch (and boy did they make a mess!). Love the caddy! I think you need to make a pattern pdf and sell it on Etsy....I'm NOT kidding! I haven't had any strange pets just daft cats! I have a white cat just like your little kitten and she has a habit of bringing frogs in! hi what an unusual giveaway! great idea - now why didn't i think of that?? Functional *and* cute, I love it! I haven't really had any strange pets. Dog, bunny, betta and gold fish, 8 cats (not all at once). Maybe the 2nd betta fish I had was strange. His name was Peetie, and I got him my first year of grad school. My new grad school friends had a pool on when he would die- the guy that had the most faith in my fish-mom abilities said he'd live 3 months, all of the others said between a week and a month. Ha, no, he lived 14 months! He didn't survive his 2nd winter in NH. Helpful hint: don't keep your fish near your front door in January. My strangest pet? Nothing really strange although I don't think many people have had Blue Racer Snakes as pets. Now the choices. See I've never had strange pets as in the kid of animal, they have all been the standard cat, dog, fish, what have you. Where as they have been very strange int he personality department. There were the cats Mao who played chess, Cleo who enjoyed (and was successful in) catching bats in flight, and Nutmeg who couldn't stand not being read to if a book was open (yes she would sit on or in front of the book until I started reading aloud). Or do I go with Alice (a dalmatian) who did a darn good job at sounding like she was swearing when caught in the act of getting in trouble but was an amazing herding dog to the point that she would lay so babies couldn't crawl off their floor blankets and the cats hated her for making them all sit on the couch for an hour during the little kids nap time in the afternoon. I LOVE your giveaway! Rabbits aren't that strange...but when I was young my sister would collect dead humming birds and keep them in our freezer. Don't know if that counts as a pet or not! OMG!! !that is just so darn cute. I would love to win that. Unusual pet you say.....my husband. Can't control it, won't obey, does what it wants, won't have distemper shots. I did manage to worm it last week-end....dragging its ar.. on the ground for days. Serious, really. Give me a cat anyday. When I was in my teens, my little brother had a pet tarantula...eeewww! Cute! I can see just how handy that would be. I've never really had a strange pet, but when I was in junior high I had a white rat. The strange thing about that was that I LOVED him but I hate mice, they freak me out. well, I have never had strange pets... but I do have an American Bobtail cat called Stubby who thinks he is a dog. He plays fetch, waits for me at the door, pants....you name it lol. These caddies are super cute! Such a nifty item. Strangest pet not in my life, but my uncle raised birds my fave was the peacocks. Love your cup caddy! I had a white cat that looks like yours but he passed away 1 1/2 yrs ago. Still miss the little guy. Our strangest pet was a cat that kept getting in our house and thought she lived with us. It took us days to figure out how she was sneaking in. Lovely! Thanks for the opportunity. I had a squirrel. Wow, this coffee mug caddy is a really great idea! I love it, I have never seen a caddy at this size! As for the pets, the strangest ones have been turtles who wandered into my grandparents house, one was when I was about 10 and the other one when I was about 27. What makes it strange is that it happened in Estonia where no turtles live, in fact one appeared when all normal turtles should have been hibernating, it was way too cold. One lived with us until one day it ended up in an accident and for the other one I found a new home. These kinds of turtles were no even allowed into the country because they were endangered species. And no asking around the neighborhood had any results. Well, our "pets" include cows that come when you call, horses that nuzzle you like crazy, and sheep that run at the sound of your voice! Do mice count too? Oh, we have those because of our lazy 3 cats who get free room and board :) Thanks for this great little caddy! Warmest wishes and merry Christmas! Very cool give-away! Really love it! Strangest pet..Horned Toad, got lost in the house..spent months looking for it, went to move bed and stepped on it, cried for hours!!! Thanks for the chance at winning...Have a Blessed day. I haven't had any pet that was too strange. But my mother had a squirrel named Cheddar. My kids would feed by putting the peanuts on the deck railing. Pretty funny to watch. Thanks for the chance to win! We usually have just dogs, but we did have a couple of hamsters. They have been the strangest. once i had a chick! but my perants made me give it up and give him a better home at a small animal place were there were many other chikens he can be friends with..
and he is rememberd until this day! The stranges pet We have ever had was a snake. My husband loves snakes but it got so big that I was worried about our new babie so we found it a good home. We let our daughter keep a cricket as a pet! It was an interesting chirp to get used to:) We actually missed it when it was gone. It only lasted a month or so - it's whole adult life, I believe:) Great giveaway. Thanks for the chance. Okay I didn't really have any weird pets- dog, parakets, husband (boyfriend at the time) did have fish which he could never keep alive though :) Love your stuff by the way. African Pygmy Dormice? You made that up. I had a pet raccoon growing up. Not very exotic but he was a lot of fun. We named him Ricky because we're so clever that way. Please tell me there's a tutorial for this coming up because it is brilliant. myusername at hotmail dot com. ps do you consider kids as pets? Thank you for being part of Sew Mama Sew's Christmas giveaway! You have a generous heart and giving spirit! I haven't had any strange pets... a hamster named Suzy was the oddest! I don't know how strange they are but we had a guinea pig named Pepe. It was more strange than a dog I figure. Thanks for the chance to win! What a great idea! Thanks for sharing your talents. I havn't had an unusual pet except for my daughters pet hampster who used to watch her get dressed...weird huh? She would have to turn around or go in the bathroom so she wasn't creeped out. Unusual pets eh? Are fighting fish counted? I've had quite a few. I don't think I've had pets that can be called unusual. The most would be my hamsters? That mug caddie is just great, and I have a couple of really ugly mugs that could use it to become both useful and pretty, LOL! I'm afraid, though, I can't answer the question, since the only pet I've ever had was a little bird (I don't know the name in English, it's like a parrot, only smaller), which isn't weird at all. My sister has had a couple of cats (oh, wow, exotic), and I don't even know anyone who has stuff like snakes or monkeys or... you name it. We used to have ants in the kitchen in house where I was born. Does that count? Oh, and I had forgotten my little turtles!! I don't know what happened to them, but then I was really little by that time. They probably died and my mom took care of them. Anyway... cheers from Barcelona and thanks for the great giveaway. YAY! hmm, nothing too exciting. a cockatiel and a pug. maybe a couple of goldfish from the fair? No strange pets, just cats and dogs and a newt. I guess to most people, our rats would be the strangest pets we had. We had some really sweet ones, though. The strangest pet we had was a house spider that lived behind the bookcase, we used to catch flies and throw them in its web. I'm not sure if it qualifies as a pet but it was a good excuse not to have to do the housework! What a neat idea the caddy, I hadn't seen it before! No strange pets for me... just dogs, birds and the more usual pets so far! We keep the caterpillars we find in our produce box in a glass for a couple of hours so my daughter can examine them, before setting them free out the window... Maybe they can be considered our foster pets, albeit for a very short period of time! Oh what a great idea. Hmm no strange pets here but when I was a baby my mom babysat snakes and spiders at the community colledge. Can I still enter if I've never had a pet? (allergies) I do let spiders roam at will though. My strangest pet was a skunk, now I've got sheep, horses, dogs and cats. 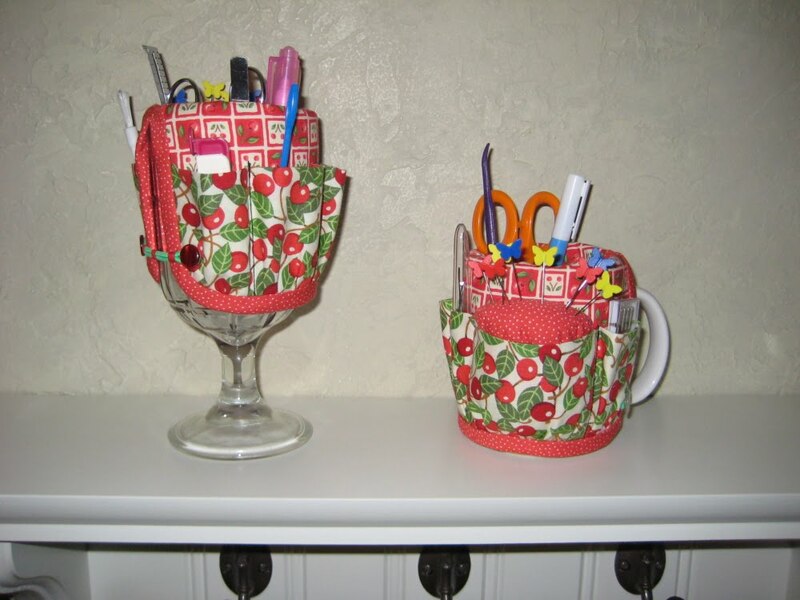 Cute idea with the mug caddy. Hmmm...I come from a pretty boring family so the strangest pet we've ever owned was a cute little terrapin tortoise. We had him when I was four and we were living in a small apartment, so we couldn't really have anything larger for a pet! ummmmm, la mascota mas extraña que he tenido ha sido una tortuga, ella me mordía los pies para pedirme comida Mientras desayunaba en la cocina en el verano, desaparecia todo el invierno escondida en el patio, honestamente la extraño. We had an wild iguana once, a Fundation was trying to preserve them, they had a park all full of iguanas, they were trying to convince us, they're good pets, I won one from them!, you can't take away their wildest side, she didn't want to stay with us, and was always trying to run away, oh!!! and the best part: my dog found her once and they had a "fight", my dog was barking like crazy and I only saw blood everywhere, the iguana injured my doggie, she now has scars of that fight, one in her right leg and the other one is in her nose, LOL! what a day! Oh, I forgot to tell!, just in case you're wondering... nothing happened to the iguana (or her sharp nails) when she attacked my doggie, she was the only one injured, poor baby! Those are too cute! As for the pet thing...nothing exciting. We just have 5 dogs, 3 cats & 2 rabbits...(all of them are fixed except the rabbits), they all are normal. Thanks for a fun giveaway! MERRY CHRISTMAS! I had two african door mice that had babies. Since I see you did too I guess they really weren't that strange. So I would have to say a pair of Lovebirds that I received as a present from my grandpa after I came home from the hospital when I was eight.I wanted a monkey but we compromised with Lovebirds! Oh that is so cute .. very creative. Sorry no strange pets ... cats, dogs ... that's it. Wait although when we bought this house 7yrs ago at the closing the house owner says to me "you want my dog". "WHAT", "do you want my dog, if not we'll drop him at the pound". Yikes so I said ok for a 30 day trial. He was a mastiff and shepard mix ... he stayed with us for 6yrs and we loved Buddy Butte with all our hearts. We really miss him. 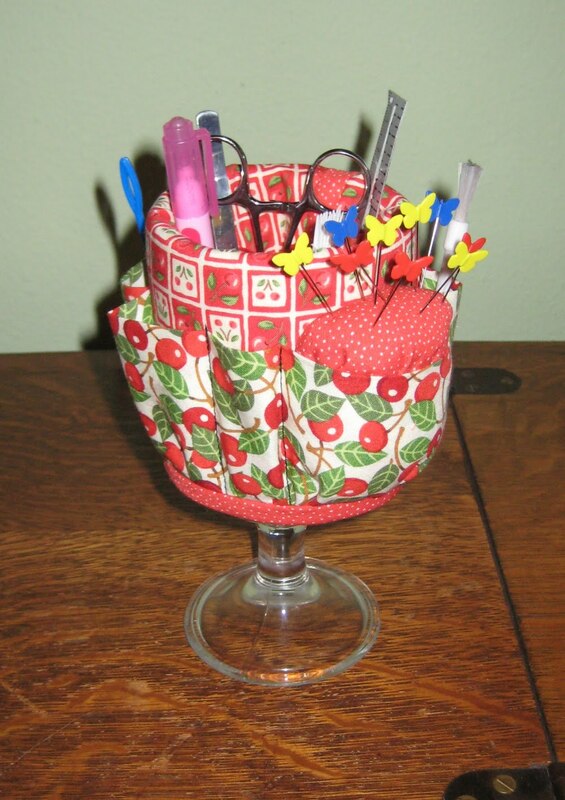 This is cute, and would be "sew" handy! Thanks for sharing. Unfortunately, the only official pet I've had besides cats is a rabbit...for one week, because it was my kindergarten class pet. Unofficially, I've had about every reptile or amphibian that lives in the Pacific Northwest, and a duckling. Very cute! We had a big ram when I was younger. With huge horns. I don't know what kind it was. But he was hilarious! Talk about coming in under the wire. Good for you to have the good sense to do this giveway day. it completely passed me by. The strangest pets so far for me personally was a little runt piglet that I nursed with a bottle and kept in a box in my room. This was pre-marriage. I was still in high school at the time. No strange pets here and the kids are all gone... but grandchildren visit , do they count? Your caddy looks like a really handy thing to have and I could use some organizing where I sew! So, I'd love to win! Cute Caddies. I have to say our strangest pets have been hermit crabs. Strange little creatures but the kids loved them. Needless to say we lost one somewhere in the house, still yet to be found. Wonder what the kids will want next. Those are such neat caddies! I'd love to have one! Seems my sewing table is a tad cluttered and things rolling all over the place and onto the floor. I've only ever had a parakeet as a child for a pet. I did 'collect' lady bugs and bumble bees in jars but would set them free after a couple days. Oh I hope I was able to enter in time. This is such an awesome idea! I love it! Please enter me into the giveaway. I've not had any strange pets I'm afraid. We've been pretty "normal". Ha! I know this is a really old post, but I found this on Pinterest and would love a copy of your pattern! Any chance you have posted it somewhere and I can't find it? Thanks!